Just beside the BGR Airport Maintenance Building on Maine Ave there is a white building tucked behind a chain link fence. Building 98 at Bangor International Airport is the home of the Maine Air Museum. This used to be known as the missile assembly building for the former Dow Air Force Base. Inside you will find a great collection of artifacts describing the aviation history in Maine. There are displays for Dow Air Force Base, Loring Air Force Base, Brunswick Naval Air Station along with other exhibits including pictures and salvaged parts from many of the crashes that have occurred in Maine over the years. As you enter there are displays of commercial aviation in Maine, seats from the set of Stephen King’s Langoliers movie which was shot in Bangor. There is a great display on the The Atlantic Challenge and a diorama of an old time air craft mechanic’s shop, everything is there, including a 1941 Stinson 10A. A P&W JT3 engine for a KC-135R at the Maine Air Museum. If you venture to the first garage bay, there is an engine from a KC-135 graciously donated by the Maine Air National Guard in Bangor. 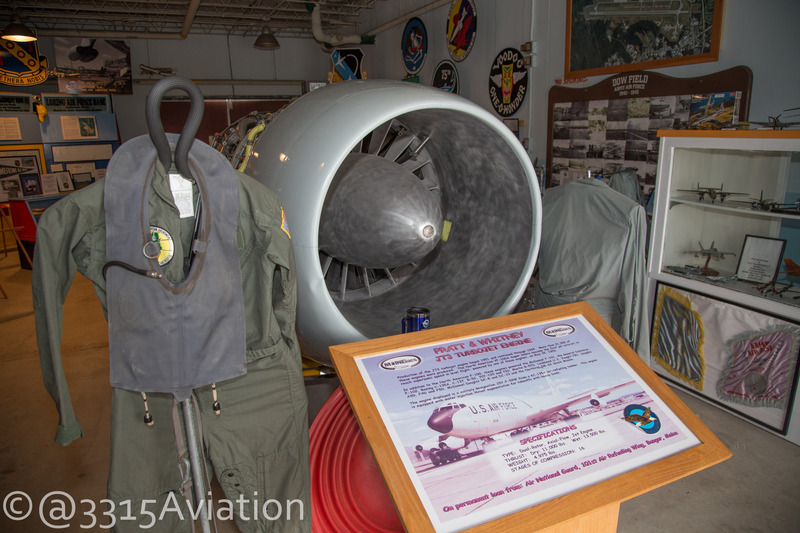 Along with the engine is a tribute to the now closed NAS Brunswick and a memorial of the 42nd Bombardment Wing (H) that was stationed at Loring Air Force Base in Limestone for 41 years. 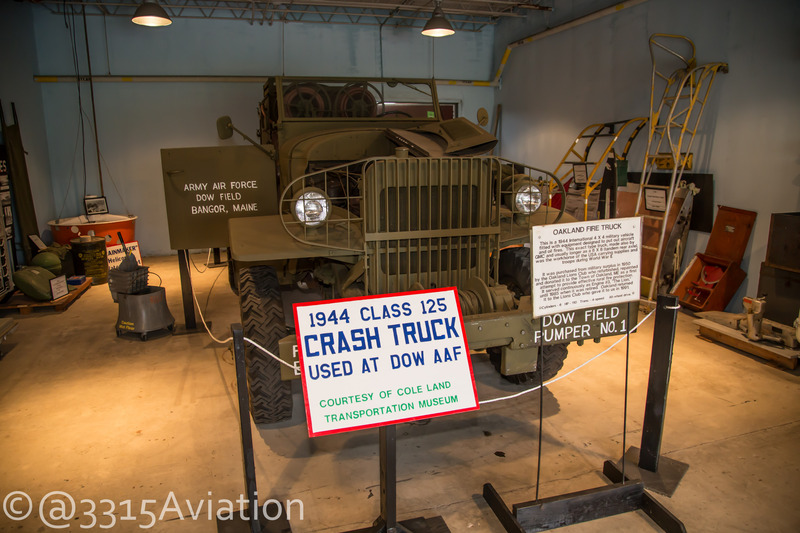 In the 2nd garage bay there is a crash truck from the Dow AAF that was donated to the MAM from the Coles Transportation Museum in Bangor, along with several pieces donated from the Maine Air National Guard. In the back corner you will even find a display dedicated to the 1947 Maine Fires and the role aviation played in fighting them. There is a huge display that is a F-101B Voodoo Landing Gear System training board. Lastly there is a great display of all the aircraft crash sites throughout the state. You will see pictures and even a piece of an F-84F Armor Plate from the Brewer Lake Crash. If you catch it on a good weather day, bring your camera because there is a platform that provides a great view of arrivals on 33 as well as air craft taxiing to depart on 33. The Museum is open Saturday’s and Sunday’s from Memorial Day to Labor Day weekend. Hours are 10am-4pm on Saturday’s and Noon-4pm on Sunday’s. Admission is $2 for adults and $1 for children. They can also accommodate you for groups and special occasions. If you would like to volunteer to help keep the history alive stop by or email Scott Grant at targete2007@yahoo.com. Crash Truck from Dow AAF on display at the Maine Air Museum. Click here for more photos from the Maine Air Museum.